My boys' room has been overflowing with piles of clothes lately. All outgrown. These things called boys grow like crazy apparently. I had all the clothes they weren't currently wearing stored in bins in our guestroom closet. Organized by size and everything. Unfortunately, I hadn't labeled the boxes any better than "baby clothes". Who wants to go pulling out big ol' stacked, cumbersome boxes and end up going through each one before realizing that you need the one on the very bottom? And so, I took it upon myself to change that. 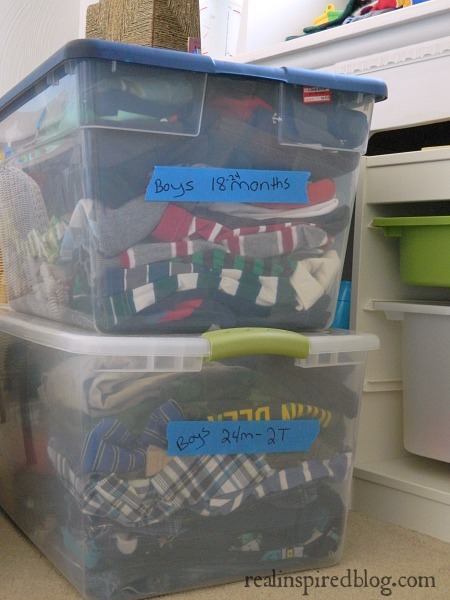 Over the weekend I bought a few extra bins, grabbed a sharpie and a roll of painters tape, gave the kids to Hubby, and advanced on the piles of clothes. After eating chocolate cake. One does need their strength for such endeavors. I sorted all the clothes by size and then filled up the bins. After each bin was full, I labeled them with the tape and sharpie. I used one strip of tape on the lid and one strip of tape on the side because I wanted to be able to see the labels even when they were stacked. I'm sure you're all rolling your eyes and duh-ing at me. I can't believe I didn't think of this before! Do you have a favorite system for storing your family's clothes?